← A proposed initiative to facilitate retirement transitions – Please vote for it! Many of our most basic biological processes including gene activation are affected by circadian and other body and cell-level clock rhythms. In January 2012, Victor posted a blog entry Circadian Regulation,NMN, Preventing Diabetes, and Longevity – an introduction to the various clock processes affecting our cells and systems and to the relationship between epigenetics and circadian regulation. Among matters laid out there was Victor’s argument “The suggestion is that direct supplementation of NMN, which is the rate-limiting step in NAD production, could have therapeutic potential, while effectively bypassing the need for NAMPT and its potentially harmful, proinflammatory effects. ” That observation was published in January 2012, almost two years before the current focus on NMN supplementation triggered by David Sinclair’s important December 2013 paper. This current blog entry highlights selected additional important insights and recent discoveries. Because the area of circadian rhythm-related research is so vast, I am forced to be very selective in deciding on the research to be covered here. I have possibly left out some important findings. One area I do touch seriously on is gene expression. It appears that expression of at least 10% of our genes is regulated by our biological clocks. So, the biological impacts of many things we do – including exercise and other interventions affecting aging – are highly dependent on the states of our clocks when we do them. And those actions may in turn affect the states and functioning of our clocks. Recent discovery after discovery brings home the importance of clock functions to our health and the necessity of respecting them. We are making discoveries about our mechanisms for modifying and resetting our clocks and gaining insights as to how clocks respond to metabolic conditions in cells. And a vast area of new research is just opening up related to how expression of various RNAs affect our circadian rhythms and vice-a-versa. From the time when our original predecessors crawled out of the ocean onto land, it became important for organisms to coordinate and optimize their metabolic and other internal activities with daily rhythms of night and dark. This applied to both plants and animals. The eventual evolutionary result was the emergence of numerous biological clocks linked to master clocks in higher organisms like ourselves. Mechanisms developed for resetting, synchronizing and controlling these clocks. Reading on here, it should become clear that conforming our activities to respecting those clocks is important for maintaining our health and modulating our aging. However, our modern lifestyles involve many factors that can disrupt our regular circadian rhythms, including but not confined to: air travel over time zones, night work, irregular sleeping patterns, irregular and late-night meals, alcohol, binge eating and drinking, stimulants like caffeine, stresses, bright lights during normal dark night times, and exposure to bright TV and computer screens before bed. Even the color temperatures of our bedroom and bathroom lights may be relevant. And aging itself may be accompanied by or accelerated by clock dysregulation. That is the relevance of this blog topic. – Living biological organisms respond to multiple temporal rhythms, the science involved being Chronobiology. Chronobiological rhythms include daily, weekly, seasonal, and annual rhythms and special ones such as connected with tides and reproduction. The rhythms are coordinated by internal clocks on the cellular level, and it may be that the periodicity of one such clock in higher organisms is the entire lifespan. – The most studied rhythms and the ones I focus on here are the daily (circadian) ones. – The clock is reset or regulated (entrained) “as the environment changes through an organism’s ability to sense external time cues of which the primary one is light. Circadian oscillators are ubiquitous in tissues of the body where they are synchronized by both endogenous and external signals to regulate transcriptional activity throughout the day in a tissue-specific manner. The circadian clock is intertwined with most cellular metabolic processes and it is affected by organism aging. – the body has a number of circadian clocks and a master clock which to some extent are coordinated. 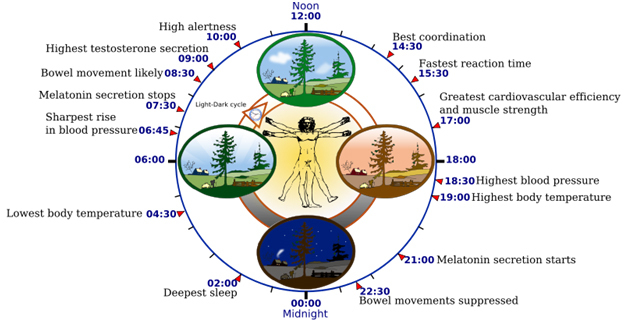 “Although circadian rhythms are endogenous (“built-in”, self-sustained), they are adjusted (entrained) to the local environment by external cues called zeitgebers, commonly the most important of which is daylight(ref)”. As we see below, recent research challenges the above classical notions in certain respects. For example, the clocks do not necessarily respond to each other in a hierarchical manner. There appears to be clocks in every cell and the various clocks may or may not be synchronized to master clocks or to each other. Every human cell contains a 24-hour circadian clock which epigenetically regulates expression of thousands of genes. Image source “Circadian transcriptional landscape. Phase distributions of circadian transcriptional regulators, nascent RNA transcripts, RNA polymerase II (RAPII) occupancy, and histone modification rhythms in mouse liver. Mean circular phase of peak binding is indicated under the name.” © 2012 American Association for the Advancement of Science. 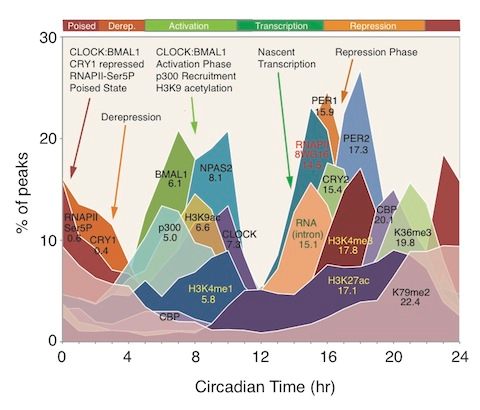 Most but not all circadian gene regulation is post-transcriptional. There is extensive body of research literature relating to circadian rhythms, sleep, sleep disorders and related pathologies(ref). There are various types of circadian rhythm sleep disorders, such as outlined in this document from the American Academy of Sleep Medicine. Circadian epigenetic clocks determine the best times for expressions of various genes and coordination of metabolic activities. Failure to respect those times, like insufficient sleep, can lead to disorders and diseases. This point was made in Victor’s earlier blog entry with respect to Type 2 diabetes. It has also been mentioned in other blog entries such as The pivotal role of Nrf2. 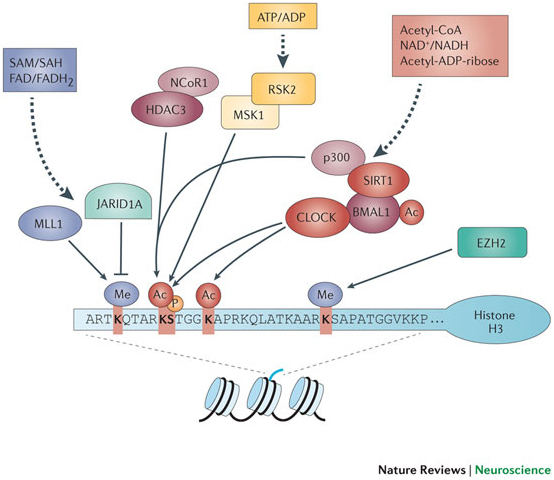 Part 1 – a new view on the control of oxidative damage and generation of hormetic effects, and New, emerging and potential treatments for cancers: Part 1 – focus on the mTOR pathway. A plethora of research publications relate circadian patterns to most if not all important disease processes, particularly those characteristic of old age. Most of these 328 publications relate circadian rhythms and sleep deprivation to Parkinson’s disease. A Pubmed search on “circadian rhythms cancer” currently produces 2623 research publications. A Pubmed search on “circadian rhythms Alzheimers” currently produces 293 research publication citations. Many of these were published in the last two years and I note that these numbers go up daily.. Exposure to blue or ultraviolet-intensive light at the wrong time can also disrupt light-entrained rhythms and lead to pathologies, as pointed out in the 2012 blog entry Blue light, sleep, mental alertness and health. It appears that our epigenetic clocks track if not to some extent regulate organismal aging. Aging can lead to dysregulation of biological clock systems resulting in immune system impairment and increased disease susceptibilities. The chronobiological responses of men and women are somewhat different. Sleep deprivation is one well-studied intervention that prevents circadian entrainment and that can lead to multiple pathologies. In mouse pancreatic cells at least, sleep deprivation stress is associated with improper protein folding and induction of the unfolded protein response (UPR) in the endoplasmic reticulum and upregulation of apoptosis. One consequence in older animals can be hyperglycemia. As explained in a Penn University news release Sleep-Deprived Mice Show Connections among Lack of Shut-Eye, Diabetes, Age: : “During sleep deprivation cells upregulate the UPR — the unfolded protein response — a process where misfolded proteins get refolded or degraded. Five years ago, researchers at the Perelman School of Medicine, University of Pennsylvania, showed that the UPR is an adaptive response to stress induced by sleep deprivation and is impaired in the brains of old mice. Those findings suggested that inadequate sleep in the elderly, who normally experience sleep disturbances, could exacerbate an already-impaired protective response to protein misfolding that happens in aging cells. Protein misfolding and clumping is associated with many diseases such as Alzheimer’s and Parkinson’s, noted Nirinjini Naidoo, Ph.D., research associate professor in the Division of Sleep Medicine in that study. Naidoo is also senior author of a follow-up study in Aging Cell this month that shows, for the first time, an effect of sleep deprivation on the UPR in peripheral tissue, in this case, the pancreas. They showed that stress in pancreatic cells due to sleep deprivation may contribute to the loss or dysfunction of these cells important to maintaining proper blood sugar levels, and that these functions may be exacerbated by normal aging. — “The combined effect of aging and sleep deprivation resulted in a loss of control of blood sugar reminiscent of pre-diabetes in mice,” says Naidoo. “We hypothesize that older humans might be especially susceptible to the effects of sleep deprivation on the disruption of glucose homeostasis via cell stress.” — Working with Penn colleague Joe Baur, Ph.D., assistant professor of Physiology, Naidoo started a collaboration to look at the relationship of sleep deprivation, the UPR, and metabolic response with age. Other researchers had suggested that the death of beta cells associated with type 2 diabetes may be due to stress in a cell compartment called the endoplasmic reticulum (ER). The UPR is one part of the quality control system in the ER, where some proteins are made. Knowing this, Naidoo and Baur asked if sleep deprivation (SD) causes ER stress in the pancreas, via an increase in protein misfolding, and in turn, how this relates to aging. The team examined tissues in mice for cellular stress following acute SD, and they also looked for cellular stress in aging mice. Their results show that both age and SD combine to induce cellular stress in the pancreas. Older mice fared markedly worse when subjected to sleep deprivation. Pancreas tissue from older mice or from young animals subjected to sleep deprivation exhibited signs of protein misfolding, yet both were able to maintain insulin secretion and control blood sugar levels. Pancreas tissue from acutely sleep-deprived aged animals exhibited a marked increase in CHOP, a protein associated with cell death, suggesting a maladaptive response to cellular stress with age that was amplified by sleep deprivation. Acute sleep deprivation caused increased plasma glucose levels in both young and old animals. However, this change was not overtly related to stress in beta cells, since plasma insulin levels were not lower following acute lack of sleep. — Accordingly, young animals subjected to acute sleep deprivation remained tolerant to a glucose challenge. In a chronic sleep deprivation experiment, young mice were sensitized to insulin and had improved control of their blood sugar, whereas aged animals became hyperglycemic and failed to maintain appropriate plasma insulin concentrations. The networks that relate clock gene, circadian rhythms and gene activation in organs and individual networks and within neurons themselves are very complex and are being actively studied using computer and mathematical modeling approaches. These 2012 publications Modeling the emergence of circadian rhythms in a clock neuron network describes “a model for a network of interacting clock neurons to describe the emergence (or damping) of circadian rhythms in Drosophila fly, in the absence of zeitgebers.” The 2012 publication Effect of network architecture on synchronization and entrainment properties of the circadian oscillations in the suprachiasmatic nucleus describes a mathematical model that accounts for the heterogeneous organization of the SCN is presented and used to study the implication of the SCN network topology on synchronization and entrainment properties. Followers of the aging sciences know that IGF-1 signaling is essential in early animal development and yet plays a strong pro-aging and pro-disease role later in life. Indeed in many animals, inhibition of IGF-1 signaling in mature animals via TOR inhibition is a proven strategy for modest life extension That is how rapamycin extends life. Here is another angle: inhibition of IGF-1 signaling can lead to better sleep – at least in the fruit fly. Natural expression of the melatonin hormone responds to the circadian cycle and exogenous hormone supplementation can be used to regulate the sleep cycle. Melatonin is mentioned here because it has been much studied in relationship to circadian sleep rhythms (ref) and is widely used as a supplement. A Pubmed search on “melatonin circadian rhythm” today produces 5765 research article citations, more tomorrow. An entire blog entry could be devoted to its actions, and perhaps should be. New molecular approaches are being discovered for resetting and regulating circadian clock functions. A relatively new and only partially explored frontier of circadian-related research involves the roles of various species of RNAs – coding RNAs, micro RNAs, long non-coding RNAs, alternative-splice RNAs, lincRNAs, circular RNAs, etc. It appears both that there is both circadian control of expression of certain RNAs, and that certain RNAs can affect clock gene expression and circadian rhythms. Initial research based on the fruit fly model suggests that there is significant circadian clock control of expression on non-coding RNAs, as well as control of alternative splicing and RNA editing. Another popular model besides the fruit fly for studying circadian rhythms with respect to gene expression is the zebra fish. My comment: There seems to be agreement that the complex regulatory interactions observed in the fruit fly and the zebrafish situations are very likely to be evolutionarily conserved in mammals and are also likely to be significantly more complex in us. But so far as far as I have looked, these are yet to be thoroughly investigated and understood as far as humans are concerned. We are only at an early stage of understanding how circadian rhythms affect gene expression in humans, how RNA species affect circadian patterns. And how circadian patterns impact on expression of RNA species.. This blog entry has been a sampler of a variety of recent research relating to circadian rhythms. Whole new blog entries could be devoted to some of the subtopics such as rhythms related to gene expression, ncRNAs, melatonin and relationships among clocks. And there is the whole field of plant circadian rhythms. I expect my colleagues and I will report further on some of these topics in the near future. New findings on circadian rhythms and their impact appear almost daily. Here is one from a paper published just yesterday. ​”​Abstract: Circadian rhythms are controlled by a system of negative and positive genetic feedback loops composed of clock genes. Although many genes have been implicated in these feedback loops, it is unclear whether our current list of clock genes is exhaustive. We have recently identified Chrono as a robustly cycling transcript through genome-wide profiling of BMAL1 binding on the E-box. Here, we explore the role of Chrono in cellular timekeeping. Remarkably, endogenous CHRONO occupancy around E-boxes shows a circadian oscillation antiphasic to BMAL1. 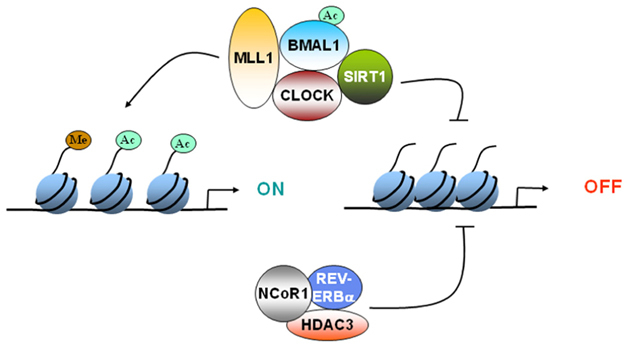 Overexpression of Chrono leads to suppression of BMAL1–CLOCK activity in a histone deacetylase (HDAC) –dependent manner. In vivo loss-of-function studies of Chrono includingAvp neuron-specific knockout (KO) mice display a longer circadian period of locomotor activity.Chrono KO also alters the expression of core clock genes and impairs the response of the circadian clock to stress. CHRONO forms a complex with the glucocorticoid receptor and mediates glucocorticoid response. 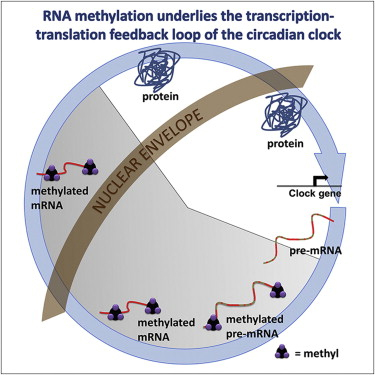 Our comprehensive study spotlights a previously unrecognized clock component of an unsuspected negative circadian feedback loop that is independent of another negative regulator, Cry2, and that integrates behavioral stress and epigenetic control for efficient metabolic integration of the clock.